This is a guest post from my mother, Laura! During the course Sumptuous Surfaces, given by Sharon B at PinTangle, I chose a beach theme and designed two projects. Both designs feature hands at the beach. The first project had a neutral color scheme with the hand outlined but not filled in with stitching (see the post Seashore). This design features more color and a major portion of the hand is stitched. This hand reaches into the water to capture a snail. I chose a primarily complementary color scheme – blues and browns. I believe I tried out as many different stitches as I could in the hand.I see chain, satin, stem, buttonhole, straight, herringbone, and ermine. Who knows what else. 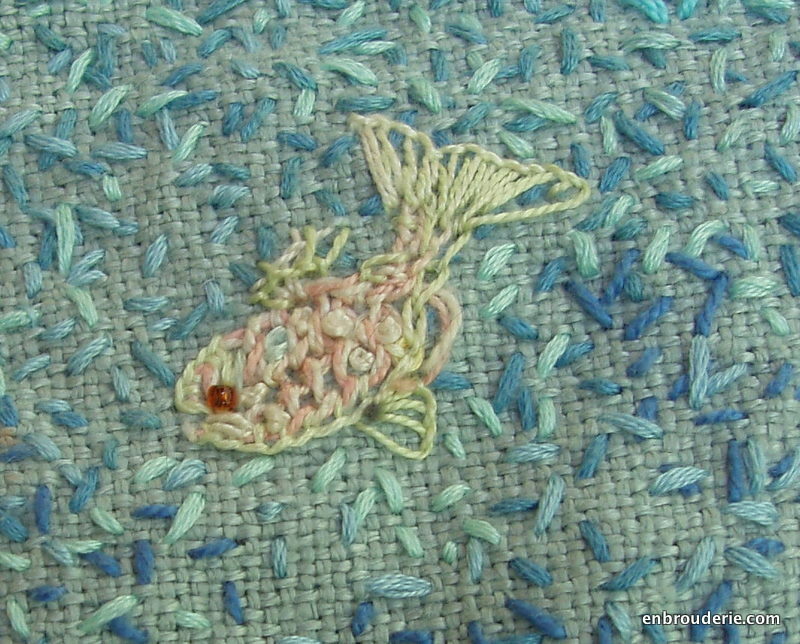 The swirls at the surface of the water are naturals for chain stitch, fly and stem stitch. For the snail shell I used yellow perle cotton. I stitched a spiral in buttonhole stitch. I then filled in with light colored variegated cotton floss between the spokes of yellow. Green #8 perle cotton whips along the base of the button hole spiral. 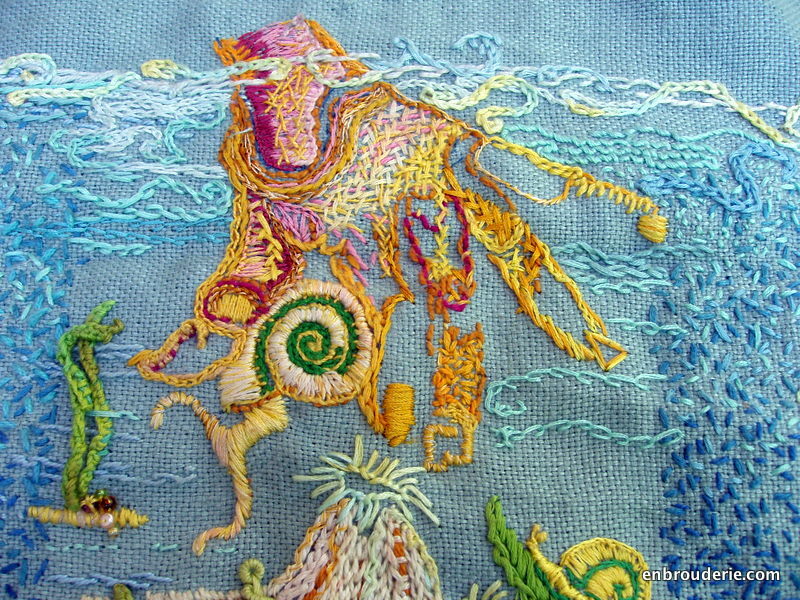 The body is made of some rather shaky satin stitch. 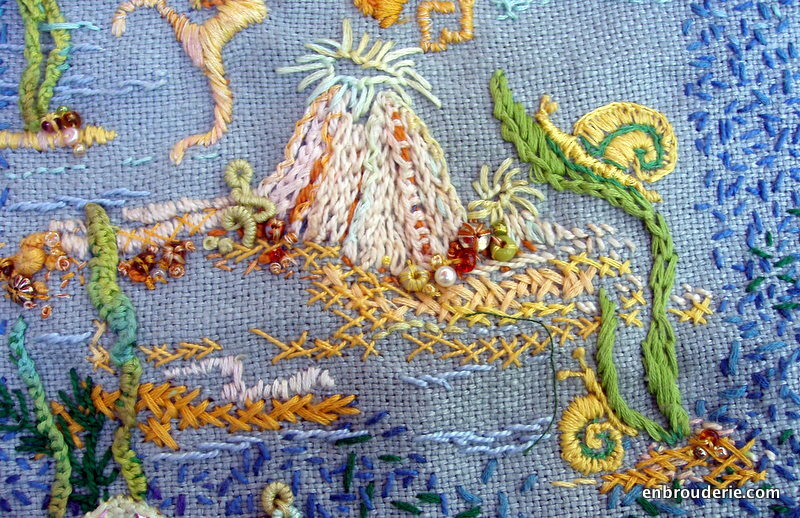 I think the satin stitch of the finger nail is much better – I was learning. I also learned cast on stitch which is perfect for seaweed. The center motif is framed by the random straight stitches in various blues, both dark and light. Critters of the interesting persuasion swim about. With these, I tried out rayon thread mixed with cotton floss. I love the shiny. The slippery just about drove me nuts. I do love tidal pools and no self respecting tide pool would lack sea anemones, snails, starfish or weird unknowns. 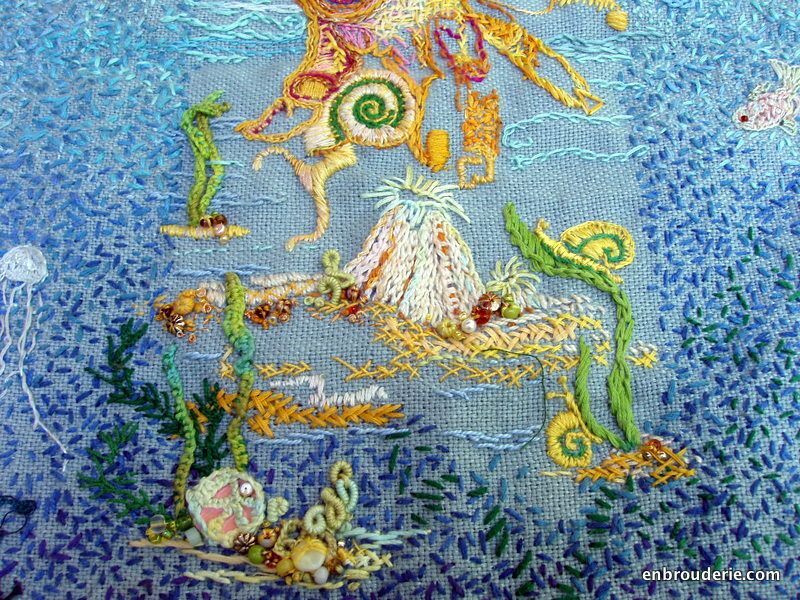 So, here is a sea floor of herringbone stitch, satin stitch and beads. 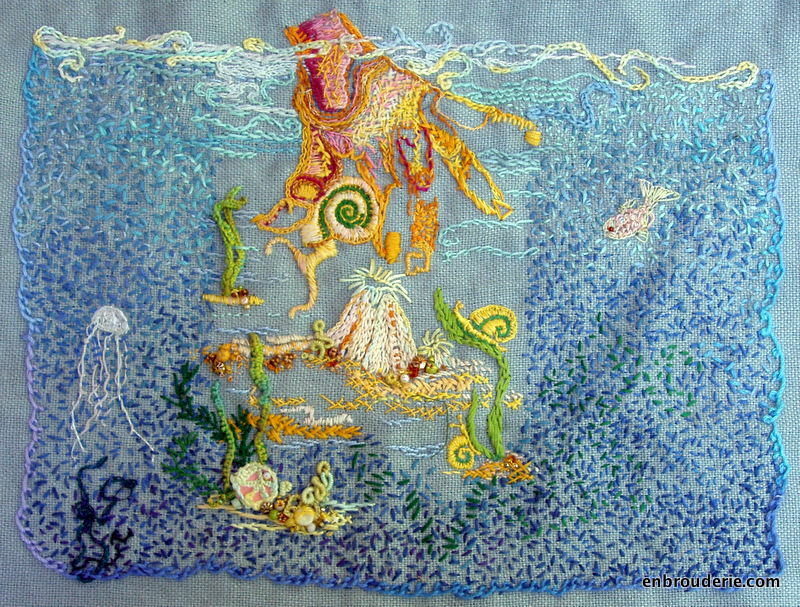 There is seaweed, both cast on seaweed and feather stitch seaweed. Plus, there is extra long twisty bouillon loops for the weird. 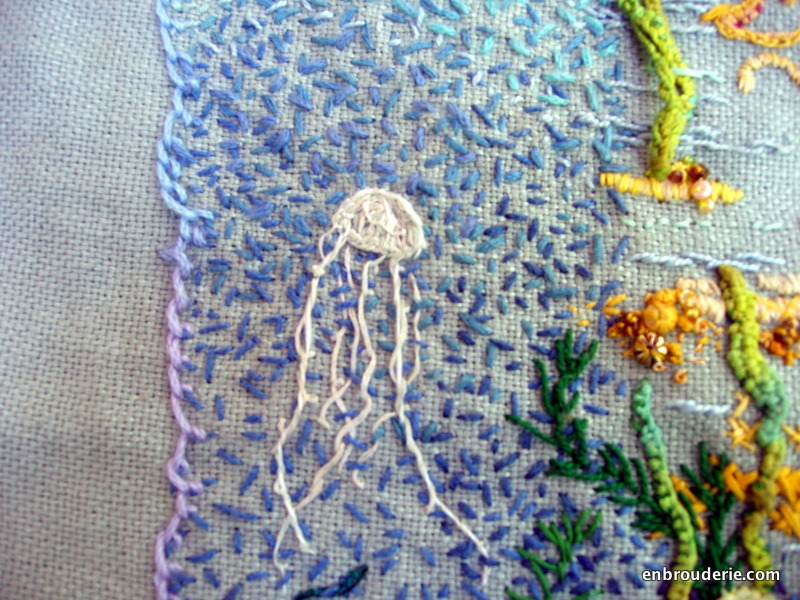 Anemone bodies are composed of chain stitch with buttonhole crowns. Thus ends the Sumptuous Surfaces experience. Two projects designed and completed counts as seriously fun. Success all around. 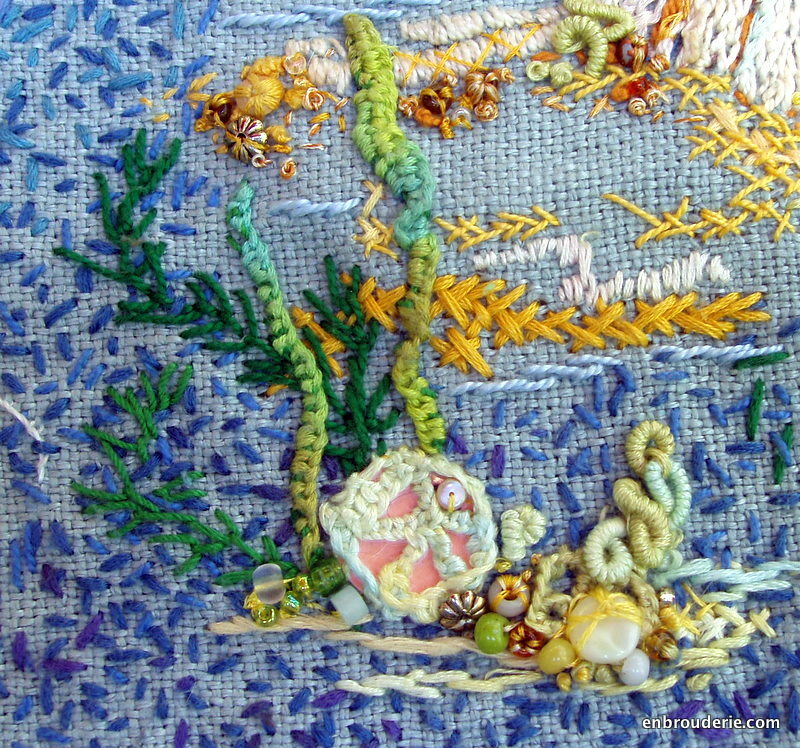 This entry was posted in Mother, Surface embroidery and tagged Buttonhole stitch, cast on stitch, chain stitch, embroidery, Featherstitch, tide pool. Bookmark the permalink. Wow! I love the fish,so.. cute! 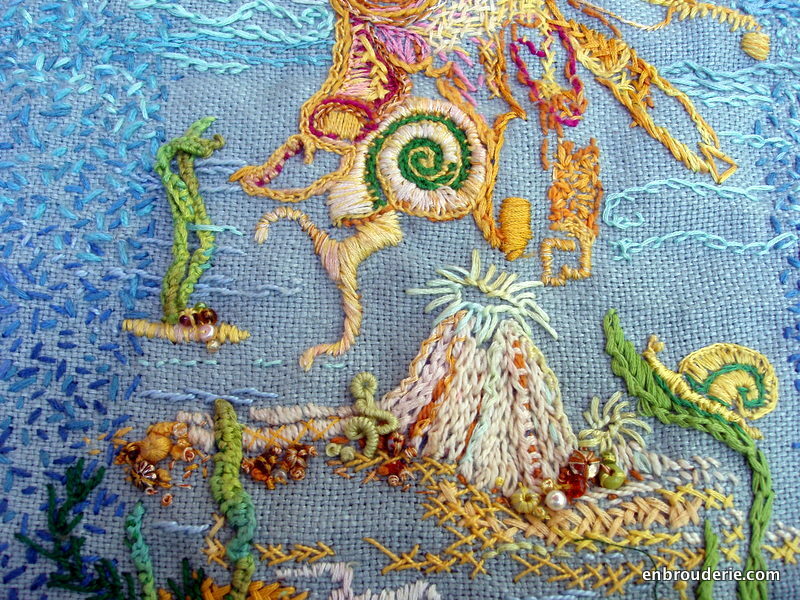 It does look as though it would have been great fun to stitch – and great use of a huge variety of stitches. Well done!